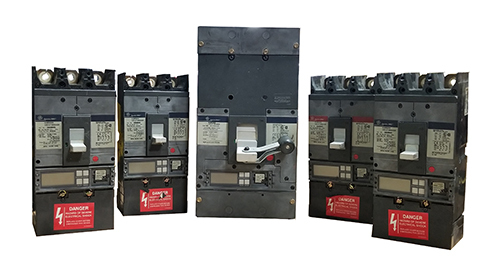 Just arrived at MIDWEST are 1 - SKHH36BB1200, 3 - SGHB36BB0600, & 1 - SGLB36BB0600 General Electric Circuit Breakers. All are Electronic Trip Units with Digital Display instead of the Thermal Magnetic Trip Units. These circuit breakers are MicroVersa Trip, Plus trip unit with LSIT - Long-Time, Short-Time, Instantaneous and Targets trip functions, solid state Electronic molded case circuit breakers. Interested in purchasing this item? Please order online by clicking the link(s) below or by contacting our Sales Team at 414.461.8200. Please mention "Found this on the New Arrivals Page" when calling. Thank you.